When you can eat delicious desserts that make you feel good, it’s a wonder why everyone isn’t on the keto diet. Especially when you can whip up no bake keto desserts in a jiff! Simple, easy and hella good-for-you, keto desserts are low carb treats you can enjoy guilt-free. As well as being low carb, keto desserts are also high in good fat, so you can satisfy your sweet tooth while keeping your diet on track. Rich in flavour and texture, it’s totally possible to create healthy desserts that actually taste good. Read on for 20 easy no bake dessert recipes you need to try! The keto diet has been staking its claim as the go-to diet for anyone and everyone. It’s a high fat, low carb diet that limits your intake of sugar and carbs, two things that are extremely prevalent in most diets. When you eat foods that are high in carbs, your body produces glucose and insulin (the fat-storing hormone), and your body uses glucose as fuel. But take carbs away and your body needs to find another source of fuel: Fat. The goal of the keto diet is to force your body into ketosis, where ketones are produced from the breakdown of fats in the liver. Fats have been shown to be one of the most effective molecules to burn as fuel, so you end up with more energy, enhanced mental focus, and a weight you’re happy with. Why is the Keto Diet so Popular for Weight Loss? There are a number of reasons the keto diet is so popular for weight loss. First off, the reduction of carbs means your body can’t burn glucose for fat anymore. Instead, it looks for other sources of fuel, and ends up burning fat and fat stores, helping you lose weight. Your insulin also drops on keto, which helps your body burn fat quick. The keto diet also helps you feel full faster and for longer, helping you eat less and stay on track for your weight loss goals. The first few days up to a couple weeks of any diet are always going to be the toughest. Especially if you had a high sugar, high carb diet (which most people do) and are switching to low carb. Here are 3 awesome tips to help fight food cravings on keto. Be honest with yourself about where the craving is really coming from. Sometimes we crave food out of boredom and habit, and the thing about these types of cravings is that they’re totally controllable. You have to have the determination and self-control to curb the craving, but if you ignore it for long enough, it should go away. Psychological cravings on the other hand are real, and they come from your body telling you that something’s missing. These are the cravings you need to pay attention to. When you crave bad-for-you foods like donuts and chips, it usually means you’re missing something in your diet (and it’s not donuts and chips!). If you’re craving sugary foods like pastries and bread, you may be dehydrated, so drink lots of water! If you’re craving salty foods like chips, you may need chlorine or tryptophan, so eat some cheese, fish or spinach. If you’re craving pop or other carbonated beverages, you could be lacking minerals, so fill up on dark leafy greens like spinach and kale! And if you’re craving chocolate, eat chocolate! Just make sure it’s dark chocolate and at least 75%, the higher, the better! The great thing about the keto diet is that you don’t have to deprive yourself of everything you love. There are wonderful keto dessert recipes that make adapting to the keto diet way easier than it may seem! Made with delicious, healthy ingredients, keto desserts will make you forget you’re eating low carb, and help you curb cravings for high sugar and high carb desserts! 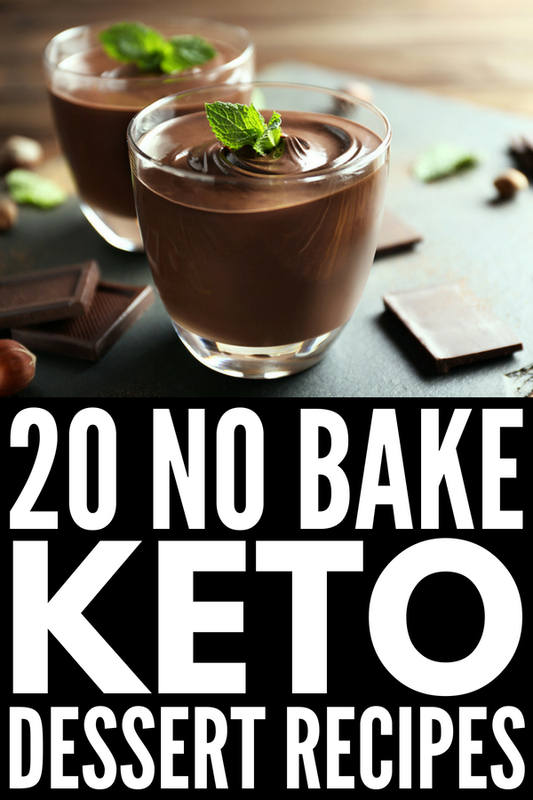 Which leads me to this list of 20 no bake desserts to make on the keto diet! Starting the keto diet doesn’t mean you can’t satisfy your tastebuds! These no bake desserts are low carb and delicious as they come! If you loved this collection of no bake keto desserts, please share this post on Pinterest! And if you’re looking for more keto recipes, follow our Health board on Pinterest!